Time on the water is precious. When you finally get the opportunity to get out in your boat, the last thing you want to do is waste that time on mundane tasks. That’s why time saving gear is so valuable – it allows you to maximize the moments you get to spend doing the things you love. 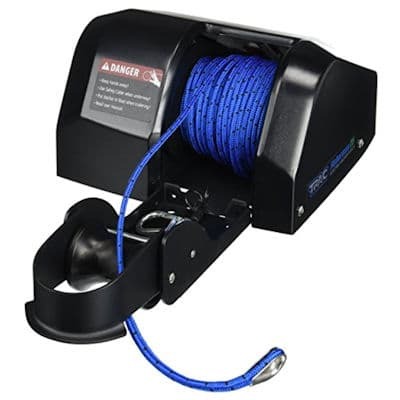 One such must-have accessory for every fishing or pontoon boat is an electric anchor winch. Why spend time and effort turning a crank or hauling up rope when you can just push a button? A good 12-volt electric boat winch can handle raising and lowering your anchor so you don’t have to break a sweat. There are a number of different electric boat anchor winches on the market, each with different features and available accessories. That is why we decided to review three of the top performers – to help you make an informed decision based on features and price. Our top pick was the MinnKota Deckhand 40 – we feel it has the right combination of features to deliver the most bang for your money. But the other items in our roundup are also worthy contenders for various reasons. Read on the find out why these three units stand out from the pack. The MinnKota Deckhand 40 Electric Anchor Winch comes out on top in our roundup of electric boat anchor winches. 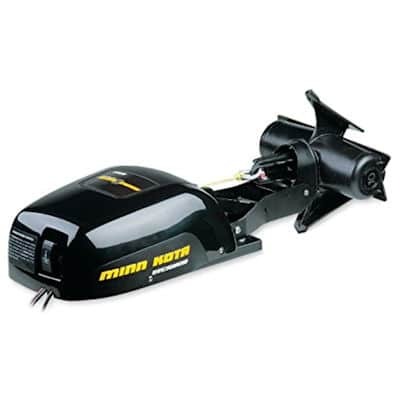 Minn Kota, which is a division of Johnson Outdoors, is best known for building excellent fishing and trolling motors. But they also make several anchor winches for both fishing an pontoon boats. The Deckhand 40 that gets our #1 spot is the highest powered winch they offer. As you might guess from the name, the Deckhand 40 is rated to raise and lower an anchor weighing up to 40 pounds. The unit comes spooled with 100′ of 800-pound test nylon rope, and runs off a 12-volt battery. Operation of the Deckhand 40 is simple – raise or lower your winch at the touch of a button. And it comes with a special anti-drag system that senses the bottom, giving you the ability to fish with controlled drifting. 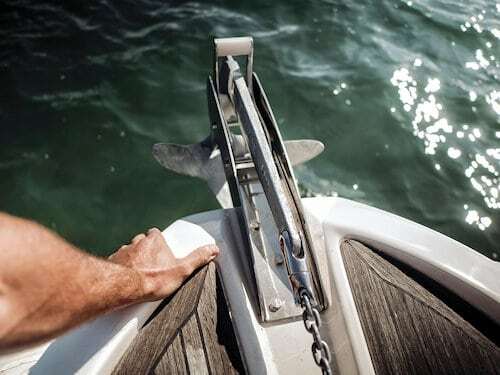 Additional features include a universal davit that can be mounted at the base of Deckhand 40, or located at a remote position elsewhere on your boat’s deck. This davit also stows your anchor horizontally, which will eliminate unwanted anchor swing. And it also features an anchor shackle that will let you make quick anchor changes if needed. And although it doesn’t come standard with the Deckhand 40, a corded remote control is offered as an accessory. 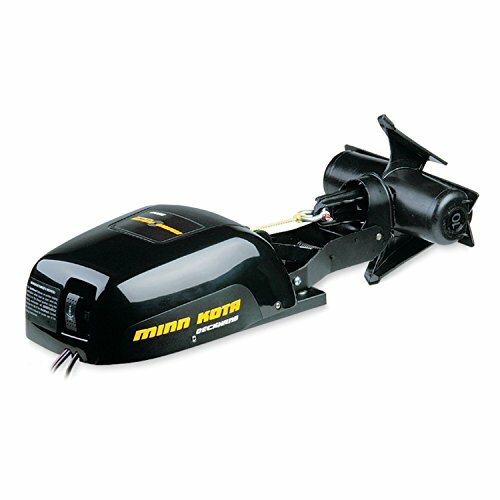 A survey of online reviews of the MinnKota Deckhand 40 on Amazon show people really like this electric anchor winch. Almost 85% of them are 4-star or 5-star, with phrases like “works great”, “the best anchor winches out there”, and “a perfect 10” common. It seems almost everyone who buys the Deckhand 40 loves it. Given the solid construction, excellent features, and great price, you can’t go wrong with the MinnKota Deckhand 40 electric boat anchor winch. Our second choice for best electric boat anchor winch is the Deckboat 35 AutoDeploy Electric Anchor Winch from Trac Outdoor Products. 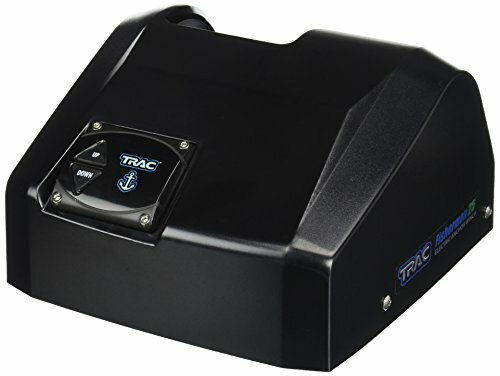 Built by a family-run business in Tennessee, the Trac Deckboat 35 offers simple 3-button controls that include an auto-deploy option. Just hit the button and the anchor drops until the unit senses it hit the bottom. This allows you to keep fishing when you hit that magic spot, without having to stop to mess with your anchor. As the name implies the Deckboat 35 will handle up to a 35-pound anchor, although the company says a 30-pound anchor is preferred. This 12-volt electric anchor winch is made with an all-steel high-efficiency motor that requires less electricity than many of its competitors. And it has a built-in davit and all the mounting hardware you need to set it up on your boat. One advantage the Deckboat 35 has over our #1 pick is that it comes with a wireless remote control. That gives you the freedom to operate the winch no matter which part of your boat you are fishing from. Several of the positive reviews for the Deckboat mentioned the remote control as a great feature. Overall, the Track Deckboat 35 is a solid choice for an electric boat anchor winch. The MinnKota model just edged it out at #1, mainly because it could handle a heavier anchor. But the Deckboat’s wireless remote control and competitive price make a great option for your boat. 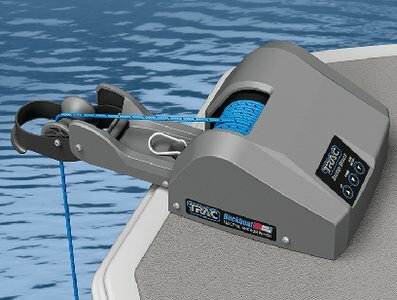 Our third choice for top electric boat anchor winch also goes to a Trac Outdoor product – the Trac Fisherman 25 Electric Anchor Winch. The Fisherman 25 has many of the features of its big brother the Deckboat 35, but in a smaller – and less expensive – package. As the number in its name implies, the Fisherman 25 maxes out at a 25-pound anchor weight. While this may seem like a large difference when compared to our other two choices, Trac claims that it is still enough for a boat up to 20 feet in length. So unless you have a larger fishing boat, the Fisherman 25 should handle an anchor heavy enough to keep you in place. 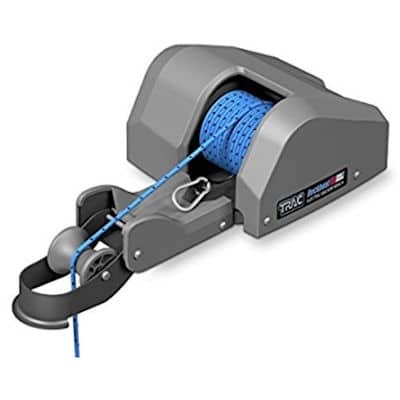 The unit comes with 100′ of braided anchor rope pre-spooled onto the winch, so all you will have to do is mount the winch, connect the wiring, attach your anchor, and go. The Fisherman 25 also includes a separate anchor davit, to keep your anchor line extended over the side of your boat. Online reviews for the Fisherman 25 are mostly positive, earning an average of 4.1 stars out of five at the time of this writing. People who loved it mentioned the ease of installation, and also the time and hassle the electric winch saves them when fishing. Unlike the Deckboat 35 the Fisherman 25 does not come with a remote control. But the controls on the unit are simple to operate. And given that the Fisherman 25 costs nearly $100 less than the other models in our round-up of electric boat winches, it still delivers excellent value for the price.